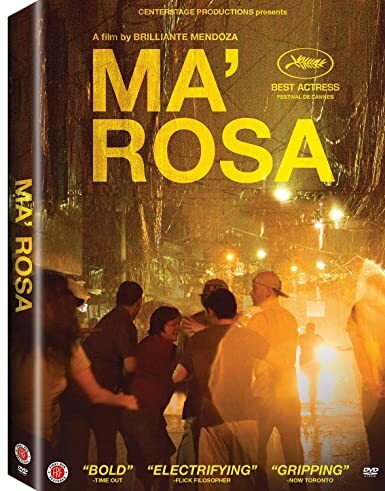 Ma' Rosa - BUY THIS DVD! Actress Jaclyn Jose took home the award for Best Actress at the 2016 Cannes Film Festival for her powerful performance as Rosa in "Ma Rosa," the riveting new film from director Brillante Mendoza. Exploring the widespread corruption and chaos of the Philippines in the Duterte era, the film follows Rosa and her husband Nestor, owners of a tiny convenience store who supplement their meager income by selling small amounts of ice (crystal meth). Eventually the couple gets caught and hauled away by police, who are more interested in collecting bribes than eradicating crime. With their parents locked away, it s left to Rosa s children to scrounge together the money to pay off the police and free their parents, by any means necessary. THEN SEND IN A COMMENT ABOUT YOUR FAVORITE FUNIMATION TITLE (you may click on artwork above for a refresher) PLUS YOUR NAME AND ADDRESS TO contests@efilmcritic.com or WeLoveHBS@aol.com. (Just one e-mail please.) Put [b]"DON'T BOUNCE A CHECK AT THE METH BODEGA" in the subject line and cross your fingers. We will draw names and one of the prizes could be yours. Only 1 entry per household.